I was up at 7, had my quiet time, ate a light breakfast, called the Mrs., and walked 4 miles on the treadmill. I worked on finalizing my new book on HEAVEN this morning. I meet with Pastor Richard Haley, Clay Dotson, and their boys for lunch today and we had a great time. I went back to the room and worked on some new chapters for new books on JESUS! I talked to my daughter Karen this afternoon and she is finalizing the order from the printers my new books, SUFFERING?, SUFFERING FRUITFULLY, and THE DOCTRINES OF SALVATION. I am also going to put together a work book for THE DOCTRINES OF SALVATION. I believe that particular book is essential for young preachers and young converts! Tonight Pastor Todd Painter who pastors in Lincoln, Nebraska, preached first and I closed out the service. 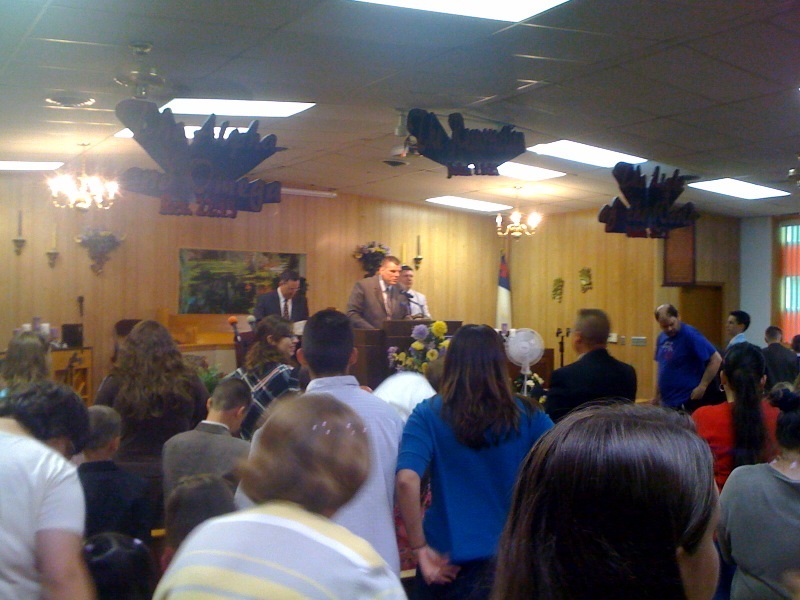 The building was full and the spirit was great! Pastor Painter preached on the subject of THE STANDARD! He did a great job! He is one of over 400 plus graduates of TEXAS BAPTIST COLLEGE. His church in Lincoln had 59 folks saved last week and is doing a great job. The one thing about TBC grads is that they are personal soul winners. By the way you don’t have to worry about someone putting a question mark on the KJB at TBC! I preached tonight on “The Danger of Change!” There is a difference between the words “change” and “improvement.” If you do nothing everything you have will deteriorate. Live fish go up stream while dead fish go down stream. It is a battle to keep from Changing!. Everything automatically deteriorates! We do not improve on the message or the methods, but we have to fight to gain ground. Truth is a position and change is a position. Truth has boundaries while change has no boundaries. Truth is finite while change is infinite. Once you start changing you never stop any where! It is a scary thing when an independent Baptist preacher starts coming up with a bunch of new things in order to impress his congregation with how smart he is! Let’s revisit the old and make it live! Look at Romans chapter one and see how the word “change” is used to describe the downfall of man morally. Gotta love the old time religion!